Google PageRank can be a useful tool to social marketers. A popularity contest is truly an apt metaphor for Page Rank because not all inbound links are equal in the eyes of Google. Links from .edu and .org domains carry extra credit, as do links you receive from other sites that Google ranks as having good content and good traffic. Think of them as votes from the in crowd. Google factors these parameters, and others, into its proprietary PageRank algorithm. For more information, see Google’s Company Page. 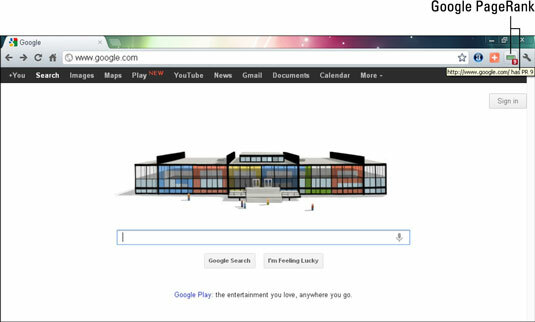 Credit: Screenshot © Google Inc. Used with permission. Download the Google Toolbar and install it. The PageRank tool doesn’t automatically appear on the toolbar, so you must enable it. On most browsers, choose ViewToolbarsGoogle Toolbar. If that option is not already checked, do so. The Google toolbar should now be visible. If you’re using Chrome, click the wrench icon to open the Toolbar Options dialog box instead of following Step 2. If you don’t see the wrench icon on the Google Toolbar, right-click any option on the toolbar. From the Tools tab, select the PageRank check box and click Save. You now see the PageRank tool on the Google toolbar. Its specific location and size depend on how you have personalized your toolbar. To see the page rank for a website, enter its domain name into the address box on your browser and wait for the page to load. Hover your mouse pointer on the PageRank tool until the box with page rank results appears below the toolbar.